This parameter block is handled by cDataSet classes and defines the dictionary fields required for using as replacements for the standard placemark icon. You may find this link useful - various markers hosted by Google. It's in Russian, but you'll get the idea. Each item is an entry in the VizMap Dictionary . In this case the field 'Artist Photo' exists in its corresponding source Excel data column, and its contents will be a link pointing to a valid image to be used as a marker. The image will be resized to typical icon size. The spots parameter section in this example generates the following jSon fragment. 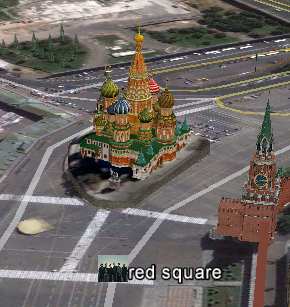 In this case, the marker for red square has been replaced by the data item showing a picture of Linkin Park, from this generated application. Questions, feedback and VizMap applications you have generated can be submitted for loading to this site via our forum. The next step is to define the VizMap Application Filename which allows you to tailor the location and name of the generated application.